Cases are started for each patient (1). Using ultrasound-based realtime locating system (RTLS) of the Norwegian company Sonitor, that have been integrated, the location of patients can be determined. The process consits of different tasks to guide a patient through surgery. Starting with scheduling and admission of the patient (3), the patient will later be tagged, so he can be found with the RTLS. Case numbers are attached to the patient's tag (4) via an mobile clinical assistant. Each single workflow step is accompanied by a characteristic event that is either recognized by an ultrasonic sensor device (5) or manually entered in a dialog-free, context-sensitive way. The events are detected by the BPM System (6) and forwarded to the monitor system (7). This allows realtime visualisation and boosts transparency. 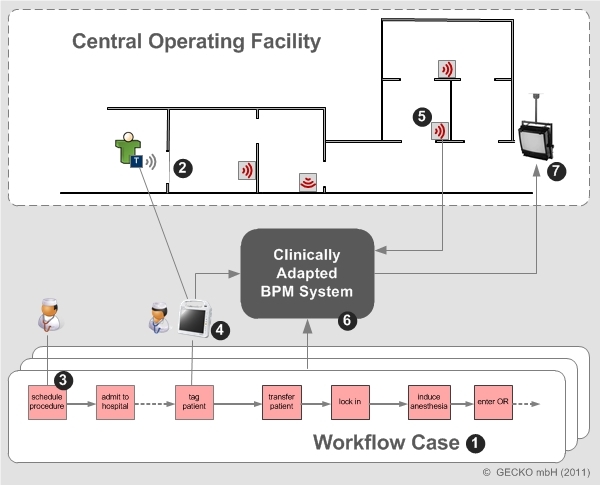 With this system not only overall workflow quality is improved, but patient safety as well.